U.S. Senate candidates Ben Cardin (L) and Tony Campbell. Maryland voters cast their ballots in Tuesday's primary for who they want to represent them in Congress. Tony Campbell is the projected winner of Maryland's Republican nomination in the state's crowded primary for a U.S. Senate seat. Campbell will face popular, well-funded U.S. Sen. Ben Cardin in the November general election. Earlier Tuesday night, Cardin won the Democratic nomination for his bid to earn a third term, beating Chelsea Manning, who was convicted of revealing U.S. government secrets but later had her sentence commuted, and six others. The Associated Press called the race less than an hour after polls closed. Check here for election results. Manning ran an unorthodox and largely under-the-radar grassroots campaign. She sought to gain traction by arguing that Cardin had been an establishment Democrat in Washington for so long that he'd lost the plot. But her candidacy failed to resonate with many voters in a blue state that's home to federal employees and defense contractors. She made few appearances in Maryland. Her platform included closing prisons, freeing inmates and eliminating national borders. Days after tweeting in May that the primaries were "rigged" and there was no point in voting, Manning made headlines after a photo on her Twitter account apparently showed her on an upper-story window ledge. Kelly Wright, a friend who also served as her campaign communications director, told The Associated Press at the time that the candidate needed the "space to heal" but would stay in the race. 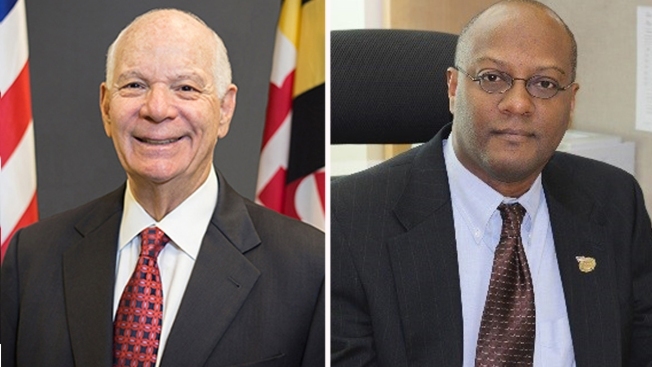 Manning and fellow candidates Jerome Segal and Rikki Vaughn wrote a June 7 opinion piece in The Washington Post, trying to push Cardin "to engage with us in a vigorous debate." They asserted he'd been "missing in action." Cardin responded that their "joint op-ed came literally seven days before voters started going to the polls, which makes you wonder the sincerity of their effort." Cardin has major name recognition within the state; he served 20 years in the U.S. House before becoming a senator in 2006. Voters chose to again nominate Republican Rep. Andy Harris, who has held the office since 2010, News4 projects. Harris looks to have defeated his two primary challengers for the seat that encompasses the Eastern Shore. He will face Jesse Colvin, the projected winner from a field of six Democrats for the party’s nomination. Longtime Democratic incumbent Steny Hoyer is projected to soundly defeat his only challenger, Dennis Fritz, a retired U.S. Air Force Chief Master Sergeant. For two decades, incumbent Elijah Cummings has held this seat, and Tuesday night he soared past the four challenging him for the Democratic nomination. Cummings is the projected winner. Democrat Jamie Raskin is projected to be nominated to run for his second term, defeating two challengers for the Democratic nomination.